An Ultra High Performance tyre, combining performance and comfort. Possible combination of P ZERO ROSSO™ Direzionale (front axle fitment) with P ZERO ROSSO™ Asimmetrico (rear axle fitment or all-round application). Developed for modern sports cars with electronic drive and stability control systems, the P ZERO ROSSO™ (or ‘Red’, as it translates into English, which is synonymous with Italian motor racing) is ideal for sports performance providing precise steering response on dry and wet roads. Directional and asymmetric: two different tread patterns designed to provide the best sports performance. The directional tread pattern, for the front axle, with its ”arrow” grooves and longitudinal channels ensure excellent grip on both wet and dry roads. 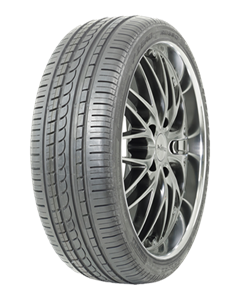 The asymmetric tyre has three distinct elements: large blocks on the outer shoulder, a central semi-slick rib with curved transverse grooves and a more open inner shoulder. In addition to the sports performance, P ZERO ROSSO™ promotes the concept of comfort through the special construction of the carcass, which combines performance with the comfort features typical of high-performance flagship cars. P ZERO ROSSO™ has achieved more than 200 original equipment homologations from leading manufacturers on top performance vehicles.